New dinner recipe your family will love! 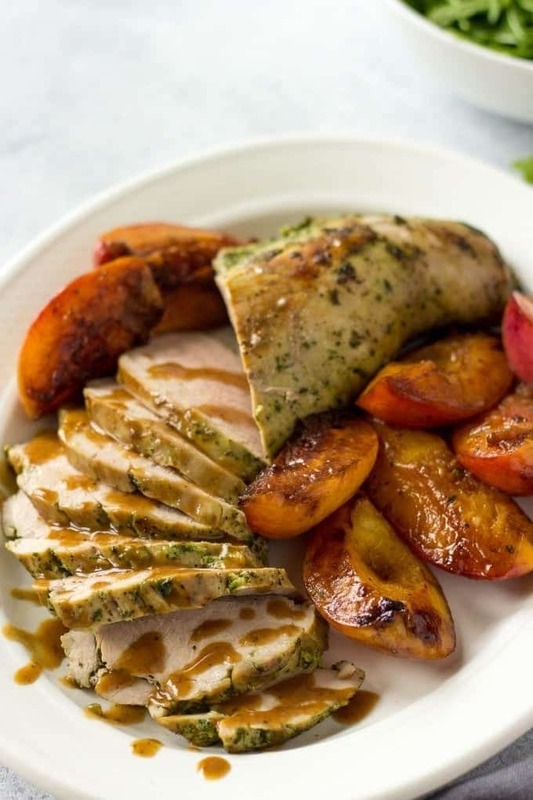 This Pork Tenderloin With Peaches is juicy, tender and so delicious! 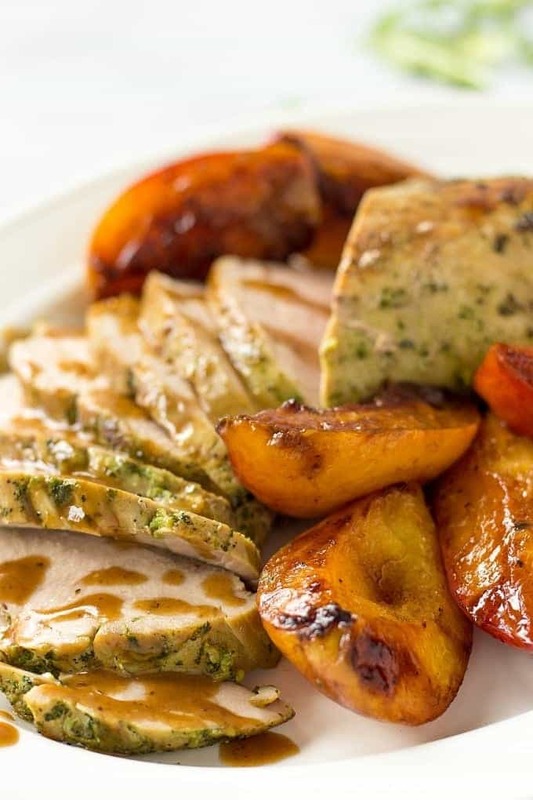 Garlic and cilantro marinade infuse the meat with flavor and slightly sweet and tangy peach sauce adds a warm and comforting aroma to the dish. Despite that the past few days and the whole March in general were quite cold, we had an amazing, full of fun little events weekend. My kid’s cousin live in NYC. So when she and her parents stopped by our place on Saturday, my little ones couldn’t be more excited. Needless to say, the kids room turned into a mess. But that’s what childhood is all about, right? Playing with your friends, having fun and not thinking about minor chaos around you. I love watching kids play with each other and observing how they shape into these cute little individuals with their own points of view and thoughts. Aside from our fun-filled weekends, week days are always busy. I’m slowly getting back into my usual routine of cooking, cleaning and taking care of the kids while my husband is at work. When my parents stayed here, they were of a huge help and gave me a little break from cooking. It was really nice, but I think, after 5 years of being a mom myself, I became pretty good at keeping my house organized and under control even without help. My mom knows I don’t eat pork very often. I usually prefer chicken recipe and my Mustard Chicken is one of my family’s favorite. But sometimes my husband specifically asks me to prepare pork tenderloin or classic Ukrainian Buzhenina. My favorite true and tried method has always been to marinate pork in a mixture of spices and then bake it wrapped in foil. So delicious! 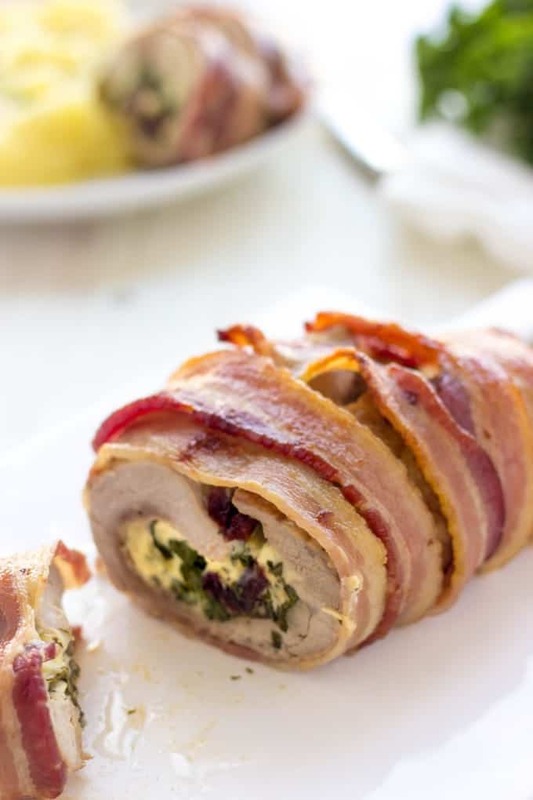 When my mom was in charge of preparing food, she decided to introduce me to the new pork recipe and made a tasty Pork Tenderloin With Peaches. The day she was making it, I was busy shooting another recipe. But when she told me that Pork Tenderloin With Peach Sauce is ready to be photographed, I was quite surprised. I didn’t expect the dish to be finished that fast, which makes it a perfect recipe for busy weekdays. The secret to a juicy and most delicious pork tenderloin ever is a simple marinade made of cilantro, garlic and soy sauce. You can marinate the pork overnight but two hours will be enough as well. The rest of the steps can be done in under 30 minutes. Sounds good, right? I usually love serving pork dishes with potatoes, like these Delicious Hasselaback Potatoes and a simple salad. But a simple steamed rice would be a great addition to this recipe too. To the bowl of a food processor add garlic, cilantro, soy sauce, black pepper and pulse until the marinade is well blended but still has some texture. Place pork tenderloin in a large ziploc bag. Pour the marinade over pork tenderloin and marinate in the fridge for 2-3 hours. Preheat the oven to 360 F and line a medium size baking dish with a foil. Heat 1 tablespoon of butter in a large non-stick pan and on a medium heat. Remove tenderloin from a ziploc bag, slightly wipe off the marinade and sear the pork tenderloin on all sides until golden brown. At the same time and on the same pan, cook the peaches until brown. Transfer the pork to the baking dish and bake for 20 minutes. Remove from the oven and cover with a foil. Meanwhile, add balsamic vinegar to a pan with peaches and stir for 2-3 minutes. Remove the peaches and set aside. Whisk in chicken broth, soy sauce, slightly increase the heat and cook for 2-4 minutes until the sauce thickens. Remove sauce from the heat, adjust the salt and stir in 1 tablespoon of butter. 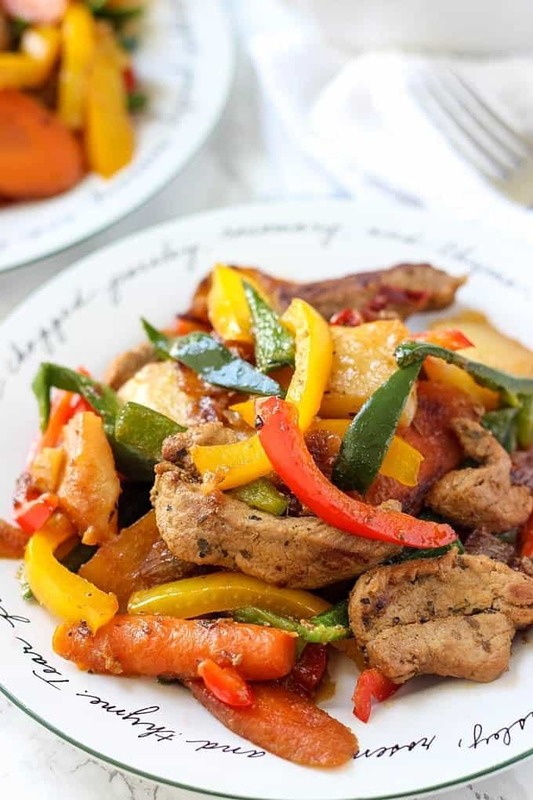 Thinly slice pork tenderloin and serve with a peach sauce. 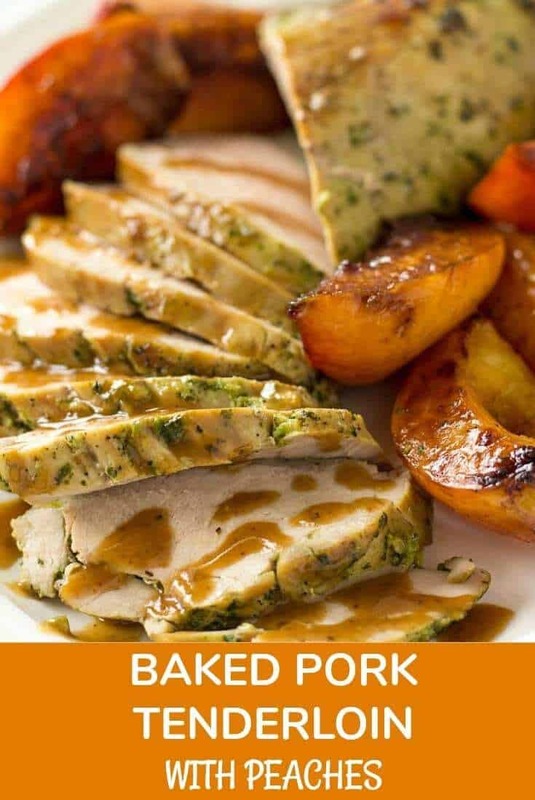 What is your favorite method to prepare pork tenderloin?